Toss the cubed beets in melted ghee/coconut oil to coat. Spread out on a parchment paper-lined baking sheet. Roast for 40 minutes, stirring halfway through. While the beets are roasting, toast the pecans if necessary. In a small skillet over medium-low heat, add the pecans. Stir occasionally until fragrant (about 5 minutes). Remove from heat. 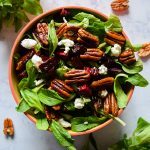 After beets have finished roasting, assemble the salad in a small bowl with mâche on the bottom and topped with toasted pecans, beets, and goat cheese. If using balsamic vinaigrette, prepare by adding balsamic vinegar and olive oil to a small bowl and whisking (or cover and shake) to emulsify. Drizzle over salad.